NBC's Pete Williams explains the preliminary charges filed against Boston bombing suspect Dahokhar Tsarnaev. “He will not be treated as an enemy combatant. We will prosecute this terrorist through our civilian system of justice,” White House Press Secretary Jay Carney said. 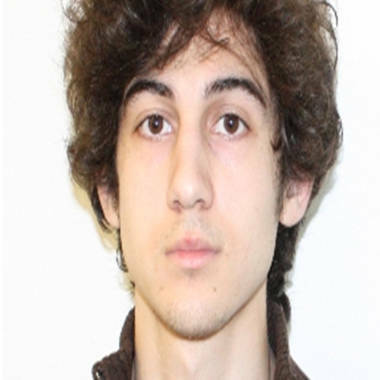 Tsarnaev, 19, a naturalized U.S. citizen of Chechen origin, made his initial court appearance at Beth Israel Deaconess Medical Center, where he was listed in serious condition. He was advised of his rights and charged with one count of using and conspiring to use a weapon of mass destruction in the U.S. and one count of malicious destruction of property with an explosive device. He was assigned three federal public defenders. The charges could carry the death penalty. The suspect agreed to "voluntary detention," but declined to answer questions about bail, according to a court record. A probable cause hearing was set for May 30. "Today's charges bring a successful end to a tragic week for the city of Boston and for our country," Attorney General Eric Holder said in a statement. "We will hold those who are responsible for these heinous acts accountable to the fullest extent of the law." A criminal complaint laid out some of the evidence against Tsarnaev, who was arrested Friday after a daylong manhunt, and his brother, Tamerlan, who was killed during a firefight with police. A black jacket and white hat, matching the ones worn by "Suspect No. 2" in surveillance video, were found in the younger brother's dorm room, along with green strands of fuse like those used in the marathon explosives that killed three and wounded more than 170. The video also captured the suspect making a cellphone call seconds before the first bomb exploded on the east end of Boylston St. during last Monday's race, and his utter calm in the face of spreading panic, the complaint said. The footage showed him hurrying away from his knapsack just 10 seconds before a blast erupted where he left it. Tsarnaev was brought to the hospital with gunshot wounds to the head, neck, leg and hand. He had been communicating with investigators in writing because he couldn't speak, federal officials told NBC News. The FBI has not officially revealed a motive for the attack last Monday that killed three people -- one of whom, Krystle Campbell, was laid to rest in Medford on Monday. Investigators are still probing whether the brothers received assistance from others, officials said. The feds have asked to speak with Tamerlan's wife, Katherine Russell Tsarnaev, who converted to Islam after she met her future husband at a nightclub. She dropped out of college, got married and had a baby three years ago. The FBI would like to speak to Katherine Russell Tsarnaev, seen here leaving the Cambridge house where she lived with husband Tamerlan Tsarnaev, her lawyer says. Her lawyer, Amato DeLuca, told The Associated Press he was trying to work out the details of an interview. His client, he said, worked up to 80 hours a week as a home health aide while Tamerlan watched their daughter. He said she didn't have any suspicions he might be plotting something. He said she last saw her husband at home on Thursday morning, hours before he and his younger brother allegedly executed a campus police officer, pulled off the carjacking, and led police on a wild bomb-tossing chase that ended in a 200-bullet gun battle. The carjacking victim told police his abductor asked if he'd heard of the marathon bombing and then said "I did that." The victim told police the two men said they "would not kill him because he wasn’t American," according to a police report obtained by NBC News. Boston's top police official said Monday that while there are many unanswered questions, the city can rest easy. "We're satisfied the two main actors, the people that were committing the damage out there, have been either captured or killed," Police Commissioner Ed Davis said on TODAY. "There is still an open question as to exactly what happened in this investigation," he said. "We can't say with 100 percent certainty...anything, actually, at this point." Among the mysteries Tsarnaev could solve is what his brother did when he traveled to Russia last year and who he met. Rep. Mike Rogers, R-Mich., chairman of the House Intelligence Committee, said on “Meet the Press” that trip could be when Tamerlan "got that final radicalization to push him to commit acts of violence and where he may have received training." FBI, Homeland Security and counterterrorism officials on Tuesday will provide a classified briefing to members of Congress on the Boston Marathon bombings. Authorities are also trying to figure out where the suspects got their bomb-making supplies and guns. Cambridge Police said neither one had the necessary permits to carry firearms. Immigration officials have arrested two of Tamerlan Tsarnaev's friends on immigration violations, days after they were detained and questioned by police in New Bedford, Mass. In another development on Monday, the FBI turned the street where the bombings occurred – Boylston Street -- back over to the city of Boston, which will begin a cleanup and decontamination process before it is reopened to the public. A specific date has not been set. As part of a handover ceremony, the FBI presented Mayor Thomas Menino with an American flag that flew at half-staff over the Boston Marathon finish line. NBC News staff writer Jeff Black contributed to this report.